No, no, that’s not a typo. I promise I really meant chicken noodle stew and not chicken noodle soup. Confused? Don’t worry, I wasn’t really familiar with the concept of stew in chicken noodle form either until a little while ago. And then it all became a bit more clear when I realized that similar dishes are often called just chicken and noodles. This stew is like chicken noodle soup but thicker, richer and magnificently more noodly. The secret to this stew is in part the quick slurry of milk + flour that is stirred into the soup mid-boil. The other secret? The noodles. 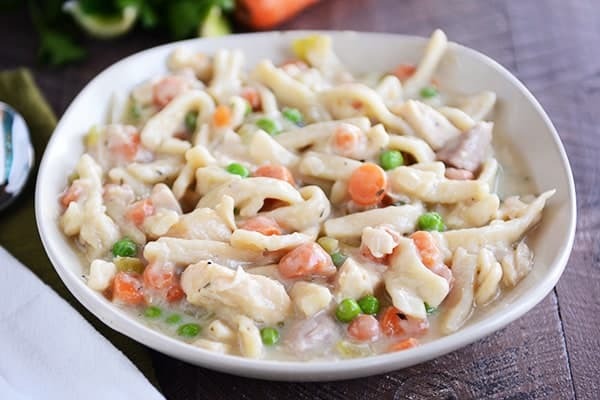 If you want the glorious flavor and thick, hearty texture of stew, bypass the curly dry egg noodles you might often use in soup and opt for either homemade noodles (super easy, remember to cut them thick) or egg noodles in the frozen aisle. Or rather, frozen egg noodles. Egg noodles that have been frozen. Egg frozen noodles. Clear enough? Reames and Grandma’s are popular, easy-to-find brands (my very average grocery store had them sitting right next to the frozen dough). It might sound like carb overload but I’ve heard that serving a thick chicken and noodle dish like this over mashed potatoes may or may not equal heaven. I can attest that about a decade ago when my friend, Tori, had us over for dinner and served her classic chicken noodle soup over creamy mashed potatoes, I about died. So we should probably all get on board with that. In a 5- or 6-quart pot, heat the olive oil over medium heat until hot and rippling. Add the onions, carrots, celery and garlic. Cook, stirring often, until the vegetables are slightly tender, 5-6 minutes. Stir in the salt, pepper and chicken broth and bring to a boil. Add the frozen noodles and simmer for 18 minutes (or according to package directions), until they are mostly tender (they'll cook a few more minutes in the next step). In a liquid measuring cup or blender, whisk or blend the milk and flour together until smooth (no lumps!). Whisk the mixture quickly into the soup and simmer for another 5 minutes, stirring occasionally. Stir in the frozen peas and cooked chicken and heat through. Add additional salt and pepper to taste before serving. The soup will thicken as it sits (and if there are leftovers, they'll definitely thicken up even more in the refrigerator). This was great! I typically make the Reames recipe (or something close to it) which is roux based. This was just as delicious – but definitely easier and healthier! Finally a thick, traditional chicken “pot pie”. I am in Pa. Dutch country and can get their “pot pie” noodles in a snap. I will be definitely trying this one. “Pot Pie” to me is thick NOT soupy. Thanks for posting, I will let you know how this turns out. This is the comfort food of my dreams. Love the thick noodles and thicker consistency. So tasty and easy to make. Especially if you have shredded chicken in the freezer. We have made this dish countless times and it is a home run with every member of my family. It is my go-to if someone needs a meal in the winter or we are having people over. I am making it as I type:) Definitly worth all five stars. So, so good! Perfect meal for the cold/flu season! Another winner, Mel! Delicious! I made your homemade noodles because I couldn’t find the frozen ones and used your chicken recipe as well. I’ll definitely make it again. Thanks! Just made this and I love it! The Reames noodles worked well. I have a lot of leftovers and was wondering if this would freeze well? Thanks!! It’ll probably freeze ok – the noodles will be quite a bit softer after thawing, but flavor should be pretty much the same. I struggle with broth soups especially chicken noodle soup. There just isn’t a lot of substance to fill me up. This is amazing since it isn’t thicker and the flavor is awesome! Love it with your homemade egg noodles too! This is a winner every time. Enjoyed this with leftover Turkey!!! My husband loved it. We both liked the stew consistency. Made this tonight and it was amazing. It’s been on my list since I saw the post earlier in the year and I cant believe I waited this long! 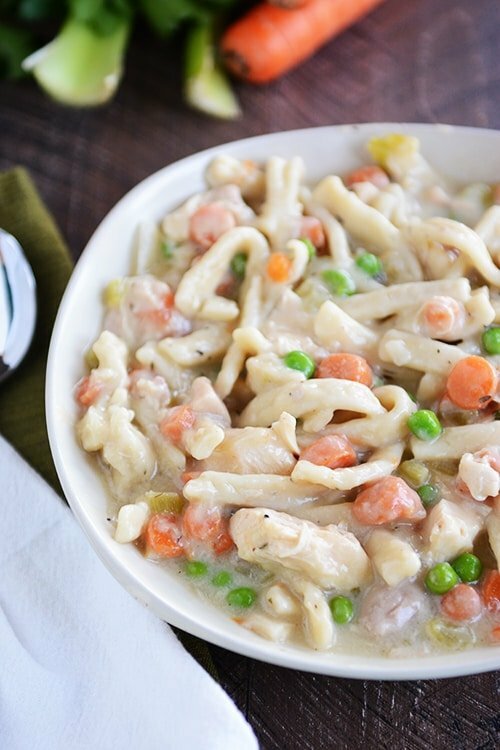 It reminds me of a cross between chicken noodle soup and chicken pot pie filling, which I love! Thanks for another great recipe. I went to a few stores no luck so I looked it up online and was so shocked to find Walmart had the noodles 🙂 So happy to have found the noodles at Wal-Mart of all places! Thank you for this good recipe. For a comfort food, I forgot the milk and half flour, and put crème fraîche. It helped us to forget the very bad french weather. Another wonderful recipe Mel! Made it tonight for family and friends. Everyone loved it! My daughter went back for a second heaping bowl because it was the “best soup ever!”. 🙂 Perfect for the snowy night we are having here. Made this for first time tonight and it was delicious. My dad, who is a soup/stew connoisseur, literally ate FOUR bowls of this. I used Gillies frozen egg noodles (red label, thicker option) and it was really great. Will definitely make again. This looks so amazing! If I want to try making my own egg noodles for this recipe, what adjustments would I need to make to the recipe? You’d just want to boil them for much less time, probably only 4-5 minutes (depending on the thickness of your homemade noodles). I made this tonight and hubby and I just stuffed ourselves. It is sooo good. My husband made some biscuits and we put the stew over them. I couldn’t find the frozen egg noodles, but my HEB had artisan dried egg noodles that cooked up thick and creamy, so it worked out great. Thank you for this recipe, it’s going in our permanent rotation. I’ve been making this for years! This is what my kids think of when they ask for chicken noodle soup. I will occasionally substitute a little heavy cream for part of the milk. I usually make my own stock using rotisserie chicken bones in the crockpot. I need to try it over mashed potatoes. It sounds heavenly! Um, can I say that this tasted every bit as good as it looked and smelled. My noodles didn’t turn out as pretty as yours but they were tasty! It was a hit and then some!!! YUM!!! Thanks for sharing. BTW, have you tried Knorrs’ homestyle chicken stock http://goo.gl/tKOUxH it’s my new favorite when I can find it! Still wishing you were in my ward so we could let our crazy boys run around together and our little girls play while we cook. For now (unless you make a sudden move to southern California) I’ll just have to pretend I know you in real life ;). Thanks for sharing and making me feel like a kitchen rock star! Made this tonight using a smoked whole chicken from the market. It was so delicious! And it came together so quickly that the words “I’m hungry, can I have a snack?” barely had time to leave my 3-year-old’s lips before I had it on the table. Thanks for yet another fabulous recipe! This looks so delish!!! Thoughts on how it will freeze?? I haven’t tried freezing this so I’m not sure – it would probably freeze ok but not great. I can see the noodles having a funky texture (or just being mushy) after being defrosted but it’s certainly worth trying if you are up for an experiment. 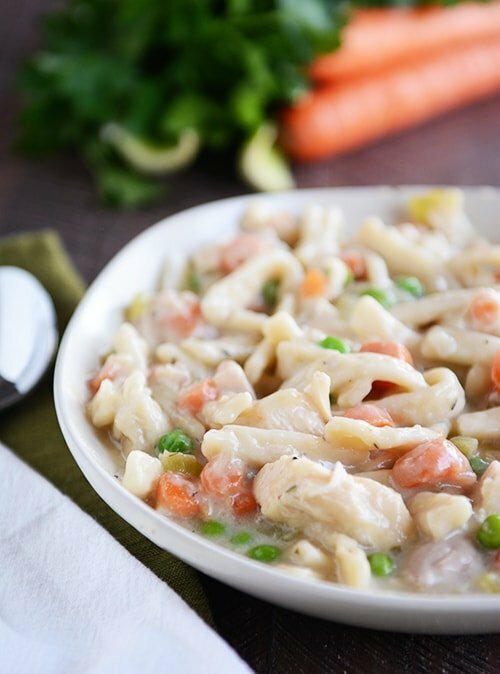 WOW….made this Chicken Noodle Stew last evening, exactly how recipe is written, and it was crazy good! My husband really loved it also. Perfect balance of flavors. Can’t wait to make it again! Next time I might make some crispy garlic crostini to go with it. – just made this , it is So Good. cannot wait till everyone gets here for dinner. I could see this going over buttermilk biscuits as well as mashed potatoes, for a different carb. option. I made this for dinner last night and it was beyond delicious! I’m an island girl so the thought of eating this with mashed potatoes did not sound appealing. HOWEVER, in Mel do I trust when it comes to food matters and I took the leap of faith. Oh boy! It really WAS heavenly!!! I even made fresh mashed potatoes today so that I could have leftovers for lunch. It is that good! Having trouble finding frozen egg noodles here in Canada- 3 stores later and no luck? All I can find is thick frozen Japanese style noodles- would these work or should I stick to dried egg noodles? Darn, I’m sorry frozen egg noodles are hard to find (and bummer you had to go to three grocery stores). You could use the dry egg noodles but the soup won’t be quite as thick – maybe decrease the liquid a little (or increase the flour in the milk slurry). Good luck! Thanks Mel! I went with the frozen Japanese noodles as tossed a coin- and was delicious !! We will try this again with the mashed potato (?) after I make a trip across the border to hunt down these elusive American frozen egg noodles- it has become a mission now- can’t seem to let it go! It was so good last night that we all now need to see what it is like with the actual correct ingredients! Thanks so much! I made this tonight for dinner and everyone loved it. Served it over mashed potatoes, which was a new concept to me, but so very yummy. Perfect meal after a cold, snowy day. I did use almond milk because the meal needed to be dairy free due to a milk allergy and the stew never did thicken. Any one have a suggestion for this? Thanks for another great recipe! I’m not positive but you might need to double the flour (or at least increase) for a non-dairy alternative. Thank you! I will give that a try next time. Mel, somehow you have this magical ability to know what kind of recipe I’m searching for and post it in your blog at the perfect time. It saved me a lot of effort trying to find a good one Can’t wait to try it!! I thought chicken and noodles was unique to my husbands Kansan family! So funny! Not something I few up eating. I cant wait to make this for his birthday next week. This looks amazing! I’m going to be adding this to our menu plan next week for sure! I was “once-every-couple-years” sick yesterday and would’ve loved these! I’m curious if you could cook the chicken and veggies in a pressure cooker and then finish the rest on the stovetop. Certainly worth a try, Heidi! Oh Chicken and noodles over mashed potatoes is a staple in Kansas! They had it for school lunch once a month and it was the most popular school lunch. That was the day all the adults would come to eat with their kids! 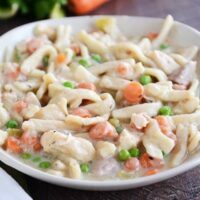 Chicken and noodles over mashed potatoes is our meal of choice for fast Sundays because you can easily justify the extra carbs 🙂 I do mine in the crock pot with the frozen egg noodles. Yum! Yes, I’ve had these over mashed potatoes, too, and they are the ultimate comfort food. I had just had a baby and my sweet neighbor brought them over. Yum! Frozen egg noodles, egg frozen noodles, noodles in the frozen aisle… are definitely the best. I always use Reames in my chicken noodle soup, and they make all the difference in the world. So thick and hearty. I’m going to give your creamy stew version a try! Looks delicious. I grew up in Indiana with and chicken and noodles over mashed potatoes were a staple. Served with Le Seuer Baby Peas. Total starch meal. On an episode of DDD, Guy goes to a resto in Indiana that serves beef and noodles over mashed potatoes. He’s confused with the double starch so asks a patron an she says “yes! double starch”. YES! I live in Indiana and this is a must-have dish! Homemade chicken and noodles (more of a stew consistency) over mashed potatoes at every major holiday. I’ve never made it but my mom and mother-in-law excel at this. down by where we used to live.